Doug Hyde, People of the Red Tail Hawk, bronze, 62" x 76" x 40"
Join Doug Hyde on a trip to one of the quarries he frequents in Colorado or Utah, and you might at first think he was some sort of shaman rather than a sculptor widely respected for what he calls his “stylized” depictions of Native Americans and western wildlife. A hammer in one hand and a gallon bottle of water in the other, Hyde walks the rough-hewn pathways flanked by walls and boulders of limestone or alabaster or marble, three of the many stone varieties he enjoys sculpting. Spying a chunk whose color pattern, size or shape intrigues him, he’ll raise the hammer and tap the rock – not to break it free, but to hear it. “I’m listening for a high-pitched, metallic, bell-like sound,” he says. “That tells you there are no flaws in the stone.” Explaining the technique later in his spacious sculpture studio about 20 miles away from his Prescott, AZ, hone, he reaches out and strikes a nearby block to underscore his point: the rock rings out clear and true. “But if you get a dull sound,” he continues, “that means there’s some sort of flaw in the stone.” And, during carving, a flaw could well reduce a promising sculpture to rubble. 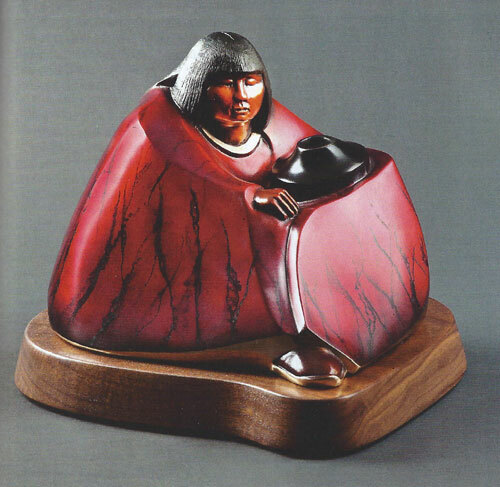 Doug Hyde, Maria, bronze, 10" x 11" x 9"
In his early teens, he took a summer art class offered to children in the tribe. “We started out with butcher paper and black ink,” Hyde says, “and I apparently got the teacher’s attention because she gave me a set of oils. But I never considered it anything more than something fun to do.” Nevertheless, Hyde continued to excel in high school art classes. A year later, Hyde decided to stay on for the Institute’s two-year college-prep program, continuing to sculpt in a private studio it provided. “We had materials from almost anywhere and were encouraged to do experimental work,” he says. 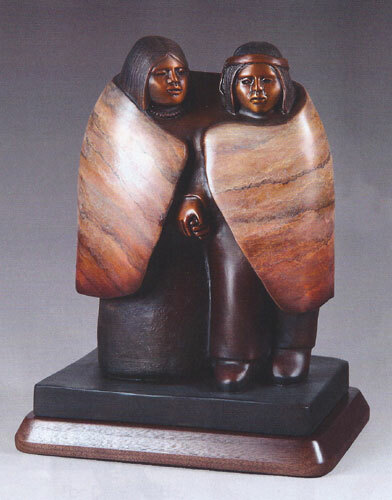 Within that brief period, he completed some 60 sculptures. Doug Hyde, Friends and Lovers, bronze, 14" x 10" x 7"
So, in January 1967, at the age of 20, Hyde enlisted in the Army. Six months later, on his birthday, July 28, he received his private first class stripes and his orders for Vietnam. Art was the last thing on his mind during his first yearlong tour of duty. “All I thought about was being on my guard, though in my letters home I would sometimes do little drawings” – mostly sketches of the bunkers in which he and his platoon mates took shelter while on patrol. Barely into his second tour, in January 1969, Hyde was seriously wounded by a Vietcong hand grenade. He spent nine months in the hospital recovering, finally leaving the service in September 1969. Back home in Idaho, he got work at the umber mill, only to be laid off two months later. “Since I had experience with stone,” he says, “I went to the tombstone company in town and got a job with them carving the granite and marble.” Suddenly, he had a wealth of sophisticated tools at his disposal and began using them to sculpt in his spare time. “That was really my turning point. 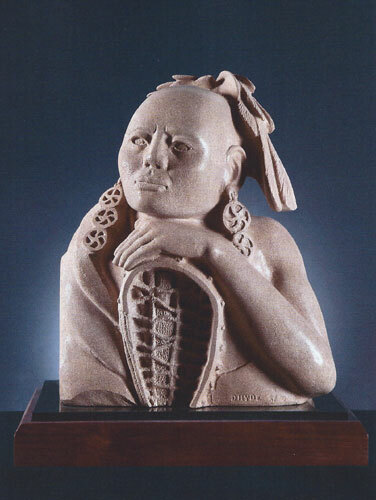 In just three years, I finished 10 of my own stone pieces.” Those sculptures, along with one painting, were featured in midsummer 1972 in his first professional show, at the Northern Plains Indian Art Museum in Browning, MT. Every one of the works sold. Doug Hyde, Lacrosse Player, limestone, 23" x 20" x 13"
Celebrating his 67th birthday at the end of this month, Hyde could easily sit back and bask in the notoriety. And he is doing a bit of that, after his own fashion. “This past year,” he notes with a laugh, “I’ve started taking off one day a week per the request of Debbie,” his wife of 23 years. The other six days he’s in his studio, hard at work on multiple projects, surrounded by blocks of stone – some maybe just 14 inches across, others 9 feet tall and weighing more than a ton and half – from which the spirits are at various stages of release. 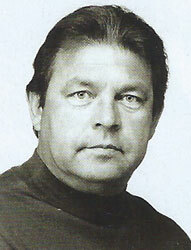 Norman Kolpas is a Los-Angeles based freelancer who writes for Mountain Living and Colorado Homes & Lifestyles as well as Southwest Art.